More than 100 religious leaders gathered Wednesday in Geneva for a two-day conference entitled "The Impact of King Abdullah's Inter-Religious Dialogue Initiative in Disseminating Human Values." Many of the listed "conference participants," however, are tainted by troubling resumes of anti-Semitism, empathy for radical Islamist ideology and support for terrorist organizations. 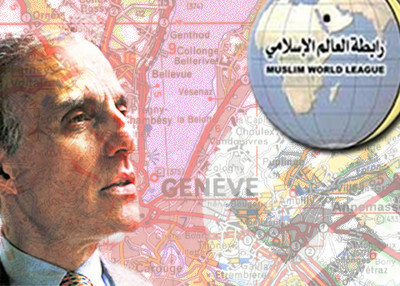 The conference organizer, the Muslim World League (MWL) is alleged to have connections to Al Qaeda. Reports detail how MWL has provided Islamic militants, including Osama bin Laden and his followers, with financial[i] and organizational[ii] help. MWL's U.S. offices have been raided by the FBI as part of an investigation into a network of Virginia-based Islamic charities and corporate entities suspected of having ties to terrorist groups. Also, MWL leaders have made statements in support of suicide bombings and published anti-Semitic articles. Perhaps the most disconcerting participant listed to attend King Abdullah's conference is William Baker – an anti-Semite with neo-Nazi connections. Baker claims that he met with the now U.S. designated Foreign Terrorist Organization (FTO) Hizballah during the Lebanon hostage crisis of the 1980s and early 1990s. While Hizballah was not yet designated at this time, Baker was hanging out with an organization that was kidnapping foreign nationals in Lebanon and holding them hostage – foreign nationals that were largely American and European. Baker was also chairman of the "Populist Party" -- founded by neo-Nazi Willis Carto in 1984 -- organizing its national convention that year. Carto, a founder of the American Nazi party, also started the Southern California-based Institute for Historical Review, a group whose central purpose is to deny the Holocaust. While serving as national chairman of the Populist Party in 1984, Baker allegedly introduced a platform which would have allowed states to restore Jim Crow racial laws. Baker's record of anti-Semitic speech cements his disturbing resume. Baker has been quoted saying that Jews are not the "chosen of God," [viii] and that he dreads getting off a plane in New York: "God help me. Why? 'Cause the first people I meet when I get off the plane are pushy, belligerent American Jews." In his book The Theft of a Nation, Baker writes that the "Zionist state of Israel . . . should be dismantled and eventually eliminated." Two other expected conference participants of interest are Larry Shaw, Chairman of the Council on American-Islamic Relations (CAIR) and John Esposito, professor of Religion and International Affairs at Georgetown University. Esposito, as a new IPT dossier shows, has close ties to radical Islamists and Islamist groups and has repeatedly defended their ideology. The dossier describes his ties and thoughts on Hamas, Hizballah, the outlawed Tunisian Islamist party An-Nahdah, the Muslim Brotherhood and other radical groups and individuals. At a past interfaith conference King Abdullah "stressed the need for better communication and understanding between Islam, Judaism and Christianity" and for others to look "the noble principles and elevated ethics that represent the foundation of religions." A neo-Nazi, a terror apologist and an organizing group suspected of past Al Qaeda ties - if this lineup reflects "noble principles and elevated ethics," we'd hate to see what the King considers to be extremist. [i] Basil Muhammad, Al-Ansaru l'Arab fi Afghanistan (The Committee for Islamic Benevolence Publications: 1991), 193. [ii] Sharaf-ad-din, Nabil. "Usama BinLaden - A Millionair [sic] Finances Extremism in Egypt and Saudi Arabia." Rose Al-Yusif, No. 3388. May 17, 1993. [iv] William Baker, "Dispelling Myths," MPAC Symposium on Jerusalem, California State University – Fullerton, May 6, 2001. [v] William Baker, "Peacemaking is the Highest Calling." [vi] William Baker, "More in Common Than You Think," Reviving the Islamic Spirit 2nd Annual Convention, January 2-4, 2004. [vii] William Baker, "Peacemaking is the Highest Calling." Sequoia Center, Buena Park, CA. [ix] Paul Woolverton, "State Sen. Shaw takes on new role in Islamic advocacy group," The Fayetteville Observer, March 8, 2009.